In April, NYUAD’s Making Theater class, accompanied by Prof. Rubén Polendo, Research Assistant Corey Sullivan, and Program Coordinator Gaar Adams, traveled to Kerala, India to study Kalaripayattu and Mohiniattum under masters Gurukkal and Chechi as an extension of the theories we learned in class. Kalaripayattu is an ancient physical art form that is seen as the root of all martial arts. The base of the form is built on animal postures and focus, attempting to embody the energy of Kali, goddess of theater, destruction, and time. In our attempts at these movements, we tried to keep these larger ideas in mind. One of the most challenging movements is called the Lion Stance, where all muscles are ready to either attack or defend. Gurukkal related Kalaripayattu to a pepper in the morning. It is beautiful as the sun strikes it, is good for you, but also burns. Mohiniattaym is one of the seven traditional dances of India. 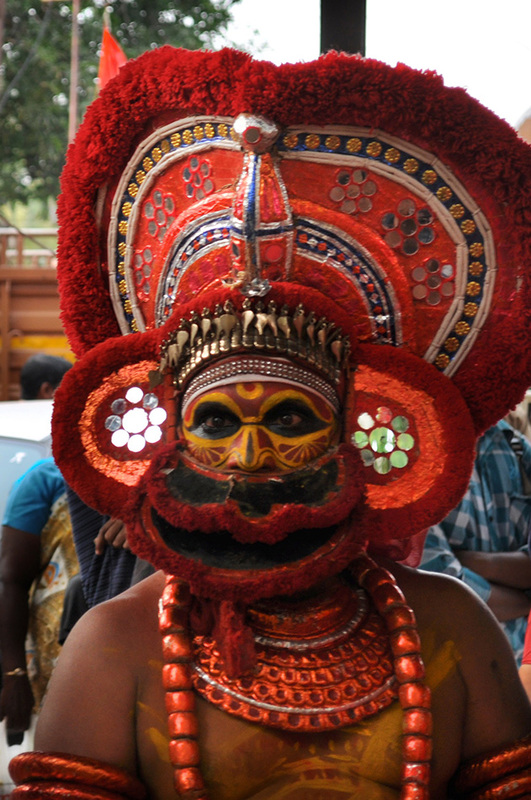 The legend behind it is that women were not allowed to watch the Kathakali (another performance art of Kerala) performances in the temples, and so they would watch from the windows, imitating the movements in a more graceful and lyrical way, or in some instances imitating aspects of nature, such as the movement of rice paddies. These movements were eventually codified with mudras (hand movements) to tell the myths of the gods. This dance gave us the challenge of maintaining grace, a core idea of Mohiniattaym, while engaging in precise physical movements. We studied both of these forms in a Kalari, a sacred space dedicated to the gods, the masters, and the passing on of these traditions. 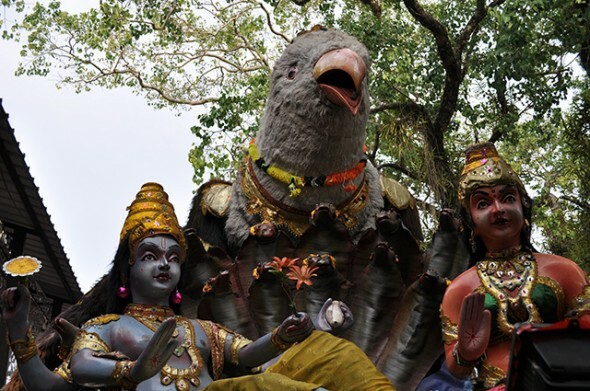 The Kalari is dedicated to Shiva, god of destruction, husband of Parvati, an incarnation of the mother goddess. Kali is a result of the union between the two – her goddess form is created in the moment of their togetherness. While on the trip we also attended part of the Kollum Pooram festival, which celebrates the New Year with a mix of Hindu and local traditions. We attended the first day of the festival, witnessing the beginning of the procession starting at a Krishna temple. Krishna is an avatar of Vishnu, god of growth and preservation. Kollum Pooram starts with a march from this temple to a Shiva temple where Indian Ballet and Kathakali are performed. They walk for over eight hours before reaching the temple, which is only a few kilometers away. 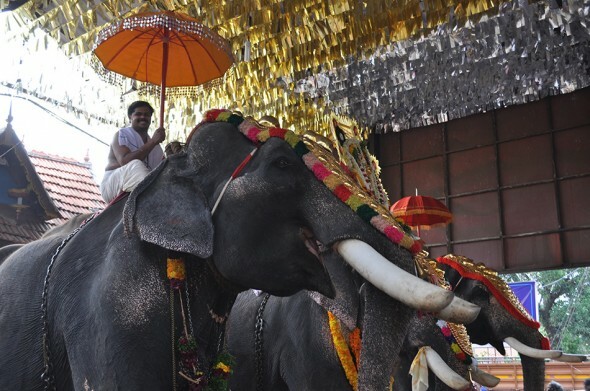 The procession includes sacred elephants carrying the gods, tayyam performers (a type of trance theater), as well as local men balancing trees on their heads in a local ritual representing the realignment of nature. The strongest memory we walked away with was from the final night at the Kalari, where Gurukkal and Chechi, along with their students, presented their art forms. A storm broke, and we needed to light the performance with candles. Sparks flew, dust rose in a cloud, incense wafted through the electric air. India is a country that always inspires me, and this trip was no different. Studying with these masters, if only for a few short days, helped me regain focus on my artistic path. It allowed us all space to step back and reflect on where we want our artistic, academic, and spiritual journeys to lead.